Consultation is key for you to achieve the best result with your stylist/technician. During this consultation, an exact price of your complete service can be given. For a general guideline of our pricing structure, please click on the relevant sections to find out more. At M we believe that hair should be simply beautiful. We create attractive shapes that enhance the look and feel of your hair which will compliment your individuality. 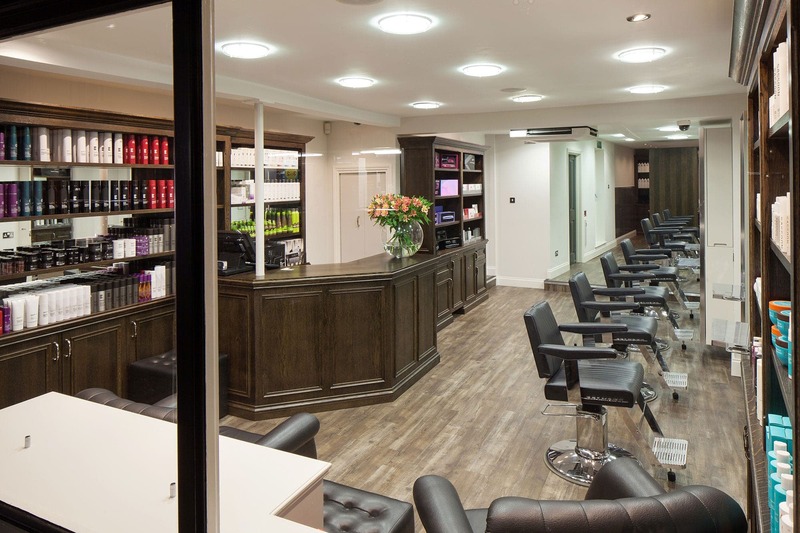 As a Sassoon Partner salon, our team are trained to the highest standards so you can guarantee that the result will be beautiful, manageable hair that you can enjoy day after day. At M we charge by time. We do this because we want your appointment to be about you and nobody else. Each stylist is growing. Their experience and skills are a reflection of the hard work and dedication they have shown to our craft. This commitment is rewarded directly in our price structure. The Colour Lounge at M is a private area for you to quietly relax and enjoy your time with us. We pride ourselves for being the only Sassoon partner salon in the area, stocking the full range of Sassoon and Wella professional colour. Our team of colourists are trained to Wellas highest master colour programme and regularly work with Sassoon for updated creative training. Your colourist will work closely with you to achieve your hair goals. Before your first visit to M we recommend we meet with you for a complimentary consultation to discuss your requirements and carry out your skin test. At M we charge by time. We do this because we want your appointment to be about you and nobody else. Each technician is growing. Their experience and skills are a reflection of the hard work and dedication they have shown to our craft. This commitment is rewarded directly in our price structure. All of our colour prices include a colour seal treatment to ensure your colour maintains long lasting vibrancy and shine. The colour seal returns your hair to its natural ph balance after its chemical service to guarantee long lasting colour results. We recommend that you book a Cleanse & Finish with a stylist, as this is not included in your colour service. Exclusive to Abstract and Sassoon Salons. An iridescent colour pallet that has no boundaries and advances individuality, perfect for your creative yet natural looking colour. Wellaplex is a new, revolutionary, in-salon system that seeks out and helps to permanently rebuild, damaged disulphide bonds (the side bonds) within the hair. Those very same bonds that give elasticity and strength to the hair. These bonds do break during chemical processes, particularly during colouring and the use of heat tools. Nothing like this has been seen before in the hair industry, and it opens up brand new possibilities in hair colour variations. Add £20 to your colour service. At M our clients’ well being is paramount. For your safety, we insist on carrying out a skin test at least 48 hours before your first colour service. This test only takes a couple of minutes and is, of course, complimentary. Individual members of our team have been highly trained in some of the more specialist aspects of hairdressing. A free consultation will ensure you get the correct advice and guidance for each and every one of our services. The Smoothing Nano Keratin Blowdry puts an end to frizzy, damaged, unruly hair. The semi permanent keratin relaxer, which lasts 3-6 months, can totally transform the condition and texture of your hair, resulting in frizz free, calmed, repaired and straighter hair, which takes far less time to blow dry, stays in shape for longer and reduces the need to use damaging straighteners. After the application, your stylist will style your hair as you usually have it, sealing the product and shape in with hot irons, the results are amazing and immediately visible. Suitable for all hair types including coloured and highlighted hair. The application process takes between 2 – 3 hours and costs from £100 depending on the hair type and length – Quotation, consultation and deposit required. When your hair needs a little extra attention we have a range of in salon prescription treatments for you to choose from. Whether you are on the go or have time to unwind and be pampered, we have the ideal treatment for you. The day that you get married is the one day in your life, where everything has to be perfect. When you have the perfect dress, the perfect partner and the perfect location, you absolutely must have the perfect bridal hair. Let us help you have the perfect day by giving you the hair you deserve. We will happily travel to your destination of choice, or you can come to us, whichever suits. We simply charge by time and a simple chat with our specialist will give us all the details we need to tailor a package that suits your needs.